Maturity Matters: All I needed to know about Leadership, I learned riding my bike! All I needed to know about Leadership, I learned riding my bike! Dr. Phil, Dr. Seuss, Dr. Spock, Dr. Dobson who is right? I mean each of them tell me they have figured out the best process for me to raise my children, resolve conflict at work and to share a great life with my wife. Every magazine I read in the grocery check out line tells me they have a lock on relationships, on personal development, on how to manage my life. I wonder if there really is some formula for how to go about improving my stance with those I love, I manage and meet each day. Somehow it seems that relationship, information, process, all work together but I am really not sure which one, in what order matters most. However, after looking at a zillion different improvement formulas I have come across one that just seems to make the most sense. The process goes by the acronym R-CAPS and the letters stand for Relationship, Content, Accountability, Prayer and Structures. The process says that in order to grow myself or others that I must first develop a relationship that fosters trust and safety, then I can introduce content that is specific to what I want to achieve, accountability means to have people in place who care enough to help me stay the course, Prayer is asking God to intervene and sustain me. Finally it is important to have structures or situations in which to prove out and practice what I have learned. As I think back to situations in which I really grew I see these elements in place. As I remember learning to ride my first bike I remember my dad holding on to the seat holding me up. I knew my dad was not going to let me get hurt, I mean I really trusted him. I also remember him telling me specifics about holding the handle bars in a straight line and remembering to pedal to maintain enough speed in order to not fall over. 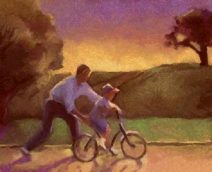 As I began to get the hang of things dad kept reminding me to “steer straight and keep pedaling” he kept me focused on what was important. Pray-you bet! Dad was asking the Dad of all dads to not let me get hurt. Finally, rather than just tell me about a bike, dad had me on a bike, in a safe place, practicing. When the time came to let go, I was ready and away I went. Flash forward forty years and it is time for me to mentor a young friend. It seems that spending time with him, learning about him and his interests is the best way for us to develop trust and learn to believe in each other. Sure he wants to learn stuff, but I need to listen well and look for the signs to understand just what it is he really needs to learn. As I pay attention to what he says and observe his life I begin to understand just what content to introduce him to. Giving him information is not worth much unless I hold him to his promise to begin to use it. So much I cannot control, only God can know the depth of our hearts and minds, so I spend time speaking to God to ask for His protection and care for my friend. Finally, and often the hard part, is to find a specific activity that will let him use his new found knowledge. Think about it. What good is it to learn about building a dog house if we do not actually try it out by building a dog house. By the way, dogs do not live in dog house theories they live in actual dog houses! Kids do not learn to ride a bike by reading a book, they learn to ride bikes by……riding a bike! And adults do not learn to mature and grow by just getting more information. Just like riding a bike, maturity takes practice, accountability and the right structures in which to try out what we are learning. R-CAPS is a method that just makes sense. What is really cool is that it is a process that is over 2000 years old. It has been used on every continent and every nation in the world. The “process” book is well known and easy to find. The teacher, the most acclaimed “growth coach” the world has ever known. To learn more read about the R-CAPS method and the organization that developed it follow this link to the book MATURITY MATTERS. Editors Note: We are reposting some of our blogs for you. David Parfitt originally posted this article in 2011. We think it is worth re-reading!